One of our biggest automotive services is performing inspections. The state of Maryland requires all vehicles to be properly inspected by certified technicians, which we have on staff. This inspection includes a look at the safety features of the car and the emissions system. The emissions system is of particular importance, as it limits the amount of carbon dioxide released into the atmosphere, reducing the risk of illness in the community. Bethesda, located in southern Montgomery County, takes its name from a local church, the Bethesda Meeting House. In 2014, Bethesda placed first in America’s most educated small towns and first on Time’s top-earning towns. It is safe to assume that Bethesda has made a name for itself across the nation. Bethesda has cemented itself in pop culture through the likes of The Bourne Legacy, Bethesda Game Studios, and The Sisterhood of the Traveling Pants, to name just a few famous works. The community is proud of its accomplishments and name recognition. 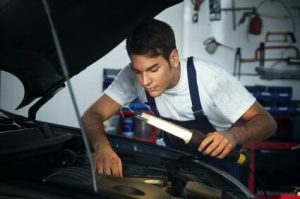 For full-service auto repair in Bethesda, MD, contact Liberty Auto Center before any other repair shop. You can reach our certified technicians at 240-686-6613 (Flower Hill) or 240-912-5625 (Redland). We would be happy to service your vehicle today.